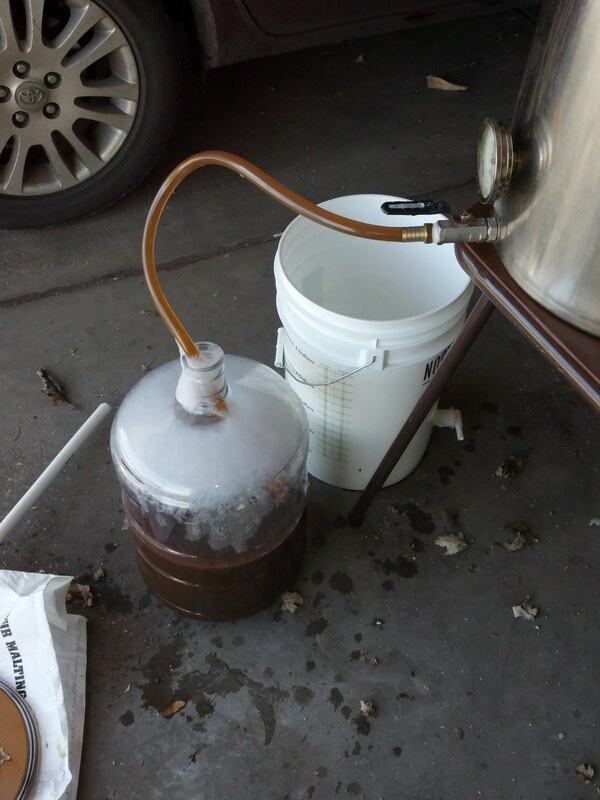 So, you may remember that last weekend, I tried to brew Eric's Red Ale, but failed miserably. See Eric's Red Failure if you want to review. I do have almost 5 gallons of Red Failure fermenting right now. We'll have to see how it goes. This past Thursday, I purchased ingredients for another batch. 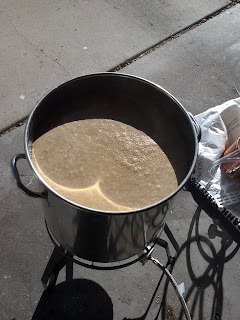 Saturday, I made another yeast starter. Sunday, I started brewing up my 2nd attempt in as many weeks. Things went better this time, although on Saturday I discovered that my hops were missing. Usually when I bring home my hops I put them either in the beer fridge or in the beer fridge's freezer as soon as I bring them home. I guess this time I set them on the kitchen counter for some reason. It took me awhile to track them down, but eventually I did. You would think that I'm too young to have senior moments like this, but you would be wrong. My Columbus hops were much higher in alpha acids than the package I had been using for last week's brew day, so I had to switch up the recipe a bit, but not too much. If you memorized the recipe last week and this week noticed that the amount of hops was less, that is why. My sparge did not get stuck, but I am still getting some grains beneath the false bottom in the mash tun. I forgot to ask at the LHBS for tips to prevent this. I'll have to try to remember next time I go. My pre-boil volume and gravity was just about perfect. Sweet. The boil was pretty uneventful. 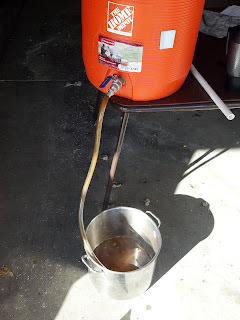 I did not use hop bags this time, and the gunk in the bottom of the brew-pot at the end seemed to reflect this. I really should start always using the hop sacks I guess. I got a little more than 5 gallons of wort into the fermenter at about 1.056 gravity. I probably could have diluted a bit to get down to the 1.053 gravity planned for this recipe, but decided that I was close enough to the target. I pitched the yeast right around 60 degrees. This morning there was nice activity and the temp was right at about 60 or 62 or so. The yeasties are going even better now. I am looking forward to drinking this batch of beer. That last picture doesn't have anything to do with beer. 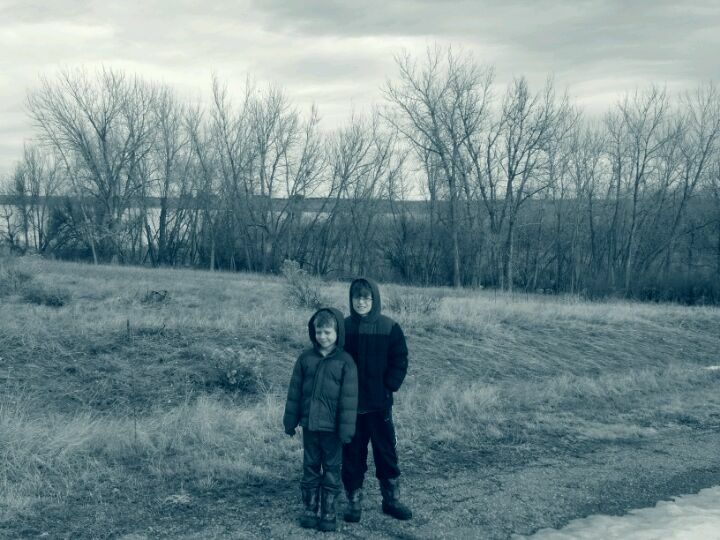 My boys and I have just been playing around with different effects on my phone's camera. I like this picture of the boys in Cherry Creek Reservoir State Park on Saturday. They are getting so big.